Based in the Twin Cities, the club is not only the largest ski touring club in Minnesota but one of the largest in all of North America. As stated in its charter, the mission of NSSTC is “to enjoy and promote the development of cross-country skiing”. We fulfill our mission through group activities, education and trail development. From its humble beginnings in 1967 with a first-year membership of nineteen visionary skiers the club, also known as NSSTC or the North Stars, has grown steadily and with a sense of purpose. Outdoor enthusiasts can find in the North Stars year-round opportunities to recreate with like-minded people. We are united by our love of silent sports, especially cross-country skiing, and the conviction that these activities will best take us into the heart and soul of the great outdoors. North Stars are a very diverse and physically active bunch of people. Members are all ages, single and married, long-time Minnesotans and recent transplants. Many members enjoy recreational skiing while some prefer the challenge of citizen racing. In addition to the main chapter of the club we have a large singles division active in both outdoor recreation and social activities. We have a mid-week group called the Wednesday Wanderers – open to anyone that has Wednesdays free. They meet every Wednesday of the year to ski, bike, hike, canoe, or do whatever the weather allows. The calendar offers day, weekend, and extended trips from December through March. It is our goal to sponsor day trips within a reasonable drive of the Twin Cities every Saturday and Sunday of the ski season.. There are more than 700 miles of ski trails within an hour’s drive of the metro area. 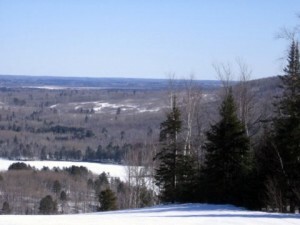 We also offer weekend ski outings nearly every weekend of the winter to resorts throughout Minnesota, Wisconsin and upper Michigan – including three-day holiday weekends. There are trips geared for families, for singles, and for general membership. Some trips are inexpensive and rustic while others are more expensive and lack none of the amenities modern resorts have to offer. 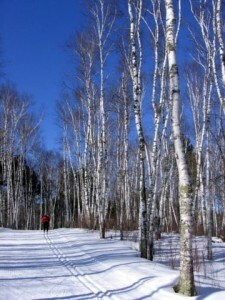 If you like to cross-country ski, we are sure to have something to suit your needs. Each winter the NSSTC sponsors week-long trips to different parts of the world. We have visited Colorado and Montana, the Canadian Rockies, and the Laurentian Mountains near Montreal. We have been lured back, time and again, to the Stokely Creek Touring Center north of Sault Ste. Marie, Michigan – a land of deep snow, more than seventy miles of trails, and incomparable Canadian hospitality. Many trips have been offered to Europe and Scandinavia including frequent trips to Norway – the birthplace of cross-country skiing. Members have skied the Olympic trails near Lillehammer and taken side trips to the unique landscape of Lapland, north of the Arctic Circle. Future destinations of this club are limited only by the vision and the willingness of members to organize trips. The club understands the importance of working to sustain and develop the sport of cross-country skiing. Over thirty years ago, the North Stars made a commitment to maintaining and creating ski trails throughout Minnesota. One of the club’s legacies is the trail work performed each autumn by dedicated members. We have spent thousands of hours cutting, brushing, clipping and removing rocks from ski trails throughout the state. We helped build the fine trail system at Battle Creek Regional Park in St. Paul as well as trails near Bemidji and in Minnesota’s Arrowhead region. The club generally sponsors seven to ten trail development projects during the months of September and October. A few involve local trails that can be cleaned up in a day, but most projects are weekend work trips to trail systems throughout central and northern Minnesota. We collaborate with county, state and federal agencies to get the work done. Nearby lodges and resorts offer us free food and lodging in return for a good day’s work. The fact that we are invited back, year after year, testifies to the importance of this annual trail maintenance as well as the quality of the work done by North Star volunteers. It is a responsibility, a stewardship, that NSSTC takes seriously. The club has been a generous contributor to many ski projects such as the Ski For Light foundation, the Minnesota Youth Ski League, and for trail improvement projects by parks, governmental agencies, and nature centers. We volunteer at the annual City of Lakes Loppet and for events such as the Junior Olympics, when they are held here. We also volunteer monthly at a local food shelf. A club for all Seasons. Originally conceived as exclusively a cross-country ski club the NSSTC has expanded its vision and become a club for all seasons. We publish an annual summer activities schedule that is as large and as popular as our winter schedule. Activities include day and weekend trips to enjoy all types of silent sports – biking, hiking, canoeing, and kayaking. All of our members are kept informed through our attractive bi-monthly printed newsletter. It lists all of the monthly activities along with educational and entertaining articles about cross-country skiing and other silent sports. Members may also subscribe to a weekly e-newsletter with updated trip news. Monthly membership meetings with a variety of informative speakers are scheduled from October through March.